We need to make our works visible and easily accessible. But once we have done this, how do we know when our brand name has been mentioned on the web? Cultivating a successful online business is an aim for everyone on Etsy. And we know it – fabulous products and proper photographs are merely the base from which we start building our business. We need to make our works visible and easily accessible. But once we have done this, how do we know when our brand name has been mentioned on the web? The easiest way is to set a Google Alert. How it works: Once you have specified your search word, Google will start checking regularly for new results that match your query. 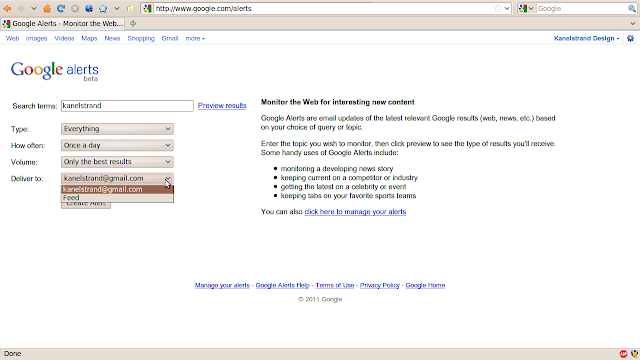 Then every time Google finds a new result (blog, web page, newspaper/magazine article), an email will be automatically generated and sent over to you. 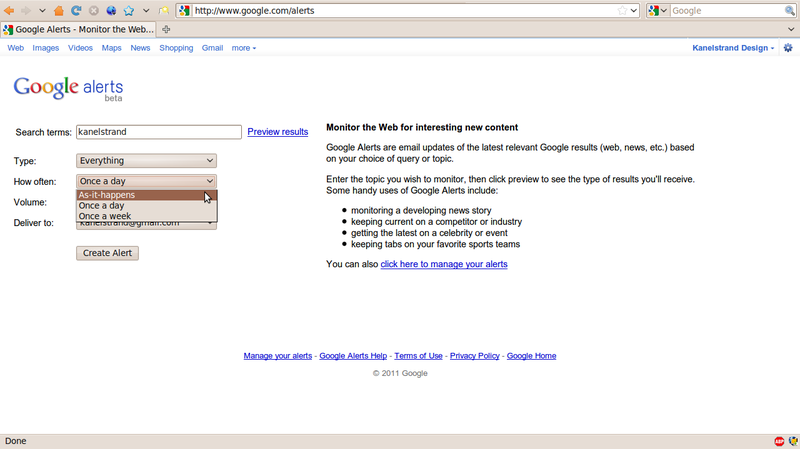 By the way, you can use Google Alerts to monitor anything you think of. 2. Type in your search term (f.ex. my brand name is kanelstrand, and I want to know when and who mentions me on the web). Then decide on the Type (i.e. where you are mentioned – in a blog, a discussion, etc. ; for best results choose “Everything”). 3. Specify how often you want to receive the email alert. 4. If you are signed in your Google Account, you will have to choose where you want the results to be delivered – in your email inbox or as an RSS Feed in your Google Reader. 6. And now you know! Are you using Google Alert? Share your experiences and suggestions! I had no idea this was available on google! I just set my alert up, thanks for sharing! 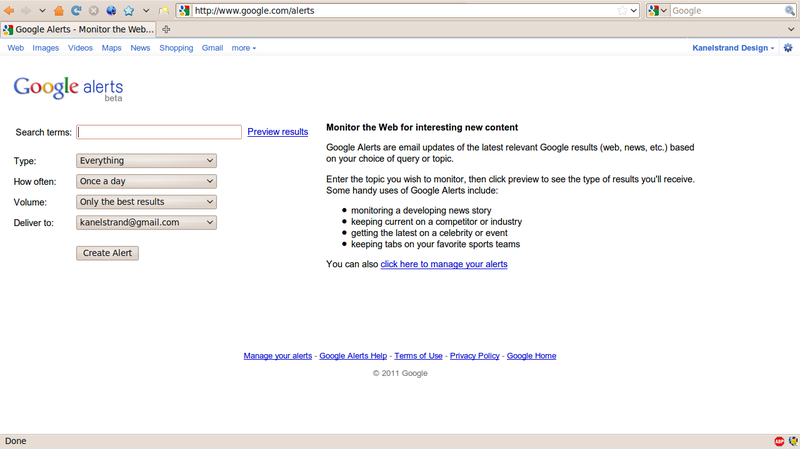 Yes, I love Google Alerts! Awesome I have used it for a couple years now for Jewelery Trends, never though of it for watching myself! Thanks! Whichever you prefer, Dianna. If you want to know who has linked to your etsy shop, you can list diannaswearableart. Or you can set the alert for dianna’s wearable art. It depends on what you are interested in. You can, of course, set two alerts, or even more. Oh, wow! I had no idea this was possible! I’ve been always curious about it. Thanks for sharing! I’m going to set it up right away! I’m with you Nadir… I had no idea either… But I do now! I added CrochetHooked (etsy name) and Braidlets (brand) …Thank you! I used to use this then it disappeared when I got a new computer so thanks, I’ve been wondering how to get this working again. I set my alert up also. This is handy for seeing how well your business name is being used and refered to. Thanks so much. I wasn’t aware of this option. I’ve always wanted to know why sometimes I get so many views on an item. Maybe this will answer that! Thanks so much for letting us know about this! wow! great new tip! thanks so much, just set my up! I’ve been using google alerts for a while now and I love finding out what blogs I’m being featured i n – I wonder why bloggers don’t let me know sometimes! Many thanks! 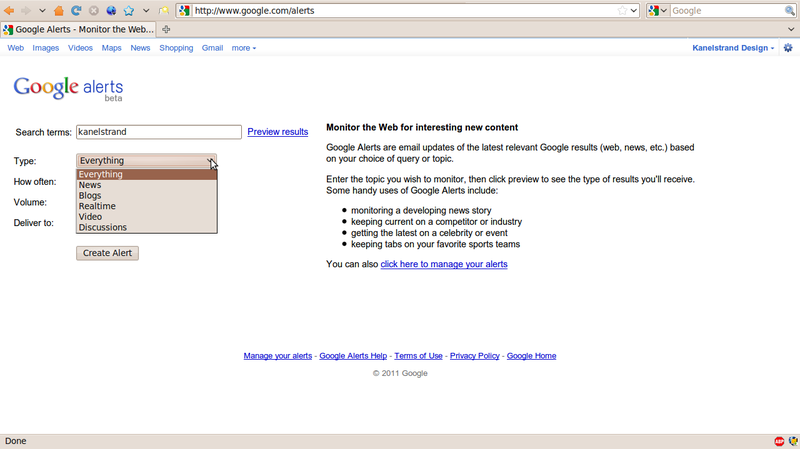 I had signed up for Google Alerts a long time ago, but it never worked well. Now it looks like it will! Love that your little nuggets of info are just that. Little tips. I can do these! Being new, and pretty much over my head, I don’t have a ton of excess brain cells in the functioning mode! This Google alert was perfect. 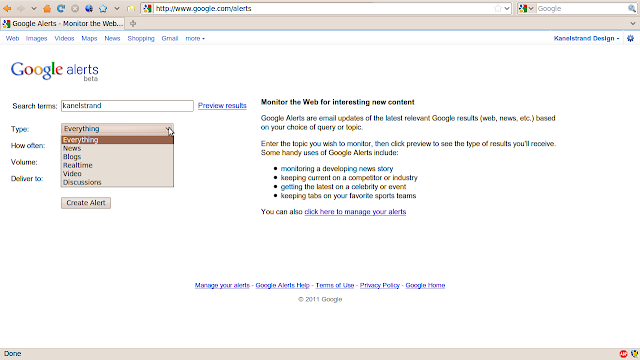 And, to top it off, I use google alert………for all sorts of knitting & sewing topics! Too funny. Never thought about putting my name in there! Thanks for being such a great guide on this new venture! Wow, that was easy! Thanks so much for the great information! Dianna, you can set up an alert for both your entire URl and also this: ‘diannaswearableart + etsy’ (without the quotes). This will pick it up both ways. For example, if you’re mentioned in conversation like this “Available at Diannaswearableart on Etsy”, it’ll pick it up that way. You can also set another alert to find “Dianna’s Wearable Art” in case you’re mentioned that way too. 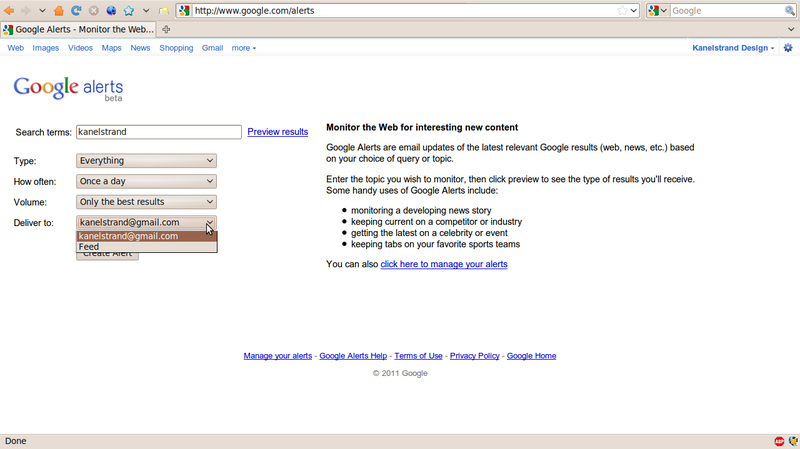 I’m on several different sites, and have all kinds of alerts set up, in different versions, and it works really well. Also, if anyone ‘names’ their items with a title, that can be put on there too, to track where that item is mentioned. 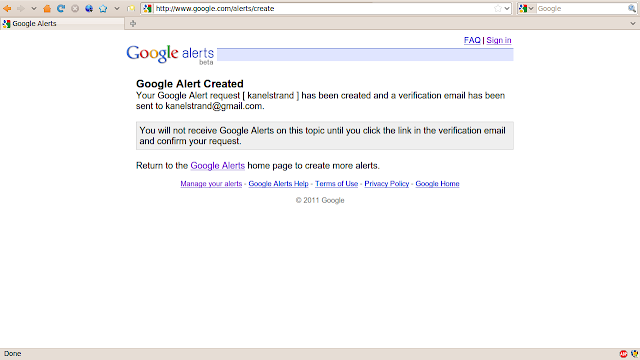 Google Alerts is a great tool, and listings are picked up right away. When I list on ArtFire & RubyPlaza, I receive alerts literally within minutes after I create a listing. Thank you for always giving great advice and sharing your resources! Handmadeology is helping me build my business and my brand. Thank you. Just set this up! I didn’t know this. Fabulous! I’m going to set some up. Thanks! Thanks for the link, this was one of many things on my “I should really do this list”. I have used Google Alerts previously for my moms quilt shop. Wow, so easy and I had no idea about it. Thanks! AWESOME! Thanks so much! Mine is all set up. Thanks for the new information. I love learning! Very helpful. I had no idea this was available. How funny; I was just checking websites listed in my Etsy stats that directed traffic tomy shop! This sounds easier! Thanks! Neat! I will try it sometime lol, It always seems to turn out more complicated than it is supposed to be, so I will write it on my stuff to do Thanks for walking me through it!